Let's land to this planet and start to dance around CIS top-charts 'al | bo' and 'Clouds Testers' projects surrounded by the rainbow musical waves of 22 unique artists Anton Shipilov, Black Mafia DJ, Denis Shapkin, Difielent, DJ Alex N-Ice, DJ Funkyman, Dj Karcep, DJ UFO & Tendresse Rage, DSP Studio, Hybrid Funk Theory, Igor Kalinin, Kolyan-BY, Legmarts, Lera K., Mad Dope, Pasha West, Pavel Gerasimoff, Pulse122, Sairtech, The Soap Opera and Wooshendoo to root here the amazing cosmic sound. The new release "Map Of Supernovas Vol. 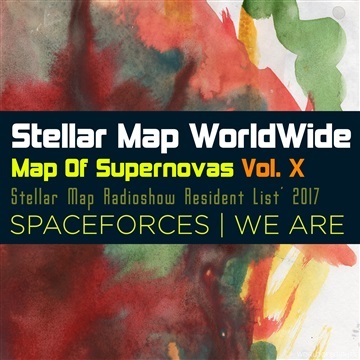 X: SPACEFORCES" by Stellar Map WorldWide / WorldOfBrights Label includes original songs and finest remixes with special karaoke-beats versions: completely ready to lift you above the ground in the dance with power of this great music!